Bob Arum agrees wholeheartedly with Al Haymon. The antagonistic adversary who’s rarely shy about blasting boxing’s most mysterious figure actually applauded him Thursday. From afar, Haymon has absorbed a lot of criticism this week for guiding Deontay Wilder away from DAZN, which offered the unbeaten WBC heavyweight champion a four-fight contract that could’ve become worth $120 million. DAZN’s deal would’ve included two heavyweight title unification fights against Anthony Joshua, the British superstar who’s aligned with the fledgling streaming service through his promoter, Eddie Hearn. As part of that agreement, Wilder would’ve been paid $40 million apiece for two fights with Joshua. It would’ve started with Wilder making a mandatory defense of his title against Dominic Breazeale. Wilder instead decided to remain loyal to Showtime, which has aired each of Wilder’s past three fights, including his pay-per-view draw with Tyson Fury on December 1. Showtime will televise the Wilder-Breazeale bout May 18 from Barclays Center in Brooklyn. The 87-year-old Arum, although affiliated with ESPN, completely supports Haymon’s position. In fact, Haymon, Wilder’s adviser, did exactly what Arum had hoped when the International Boxing Hall-of-Fame promoter learned John Skipper, DAZN’s executive chairman, attempted to lure Wilder away from Showtime and FOX by offering the Alabama-based knockout artist a nine-figure contract. Haymon and Shelly Finkel, Wilder’s co-manager, met with Skipper last week to discuss DAZN’s interest in Wilder. 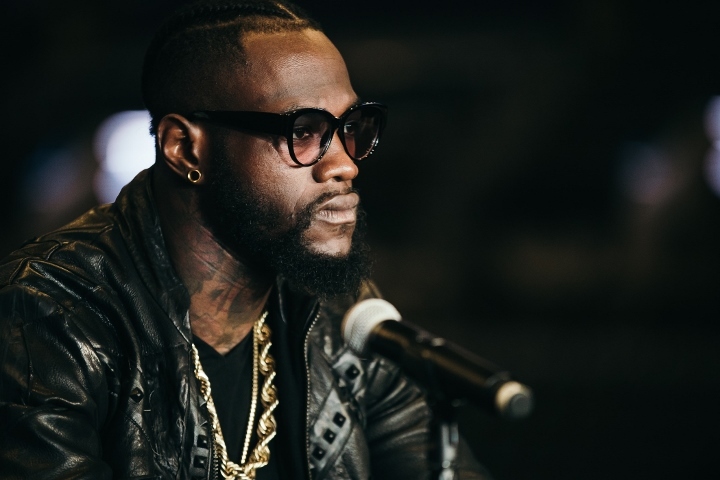 Right up until Wilder’s announcement during a press conference Tuesday at Barclays Center, speculation swirled regarding which outlet Wilder would choose. It became clear by last weekend that Wilder wouldn’t accept Skipper’s tempting proposition. Then it seemingly became a matter of which network – FOX or Showtime – would distribute Wilder-Breazeale as the main event of a pay-per-view show. Airing Wilder-Breazeale live on Showtime was not believed to be an option because Wilder would’ve been guaranteed $20 million to battle Breazeale in the first fight of his DAZN deal. The 33-year-old Wilder (40-0-1, 39 KOs) won’t make quite that much to box Breazeale (20-1, 18 KOs) live on Showtime, but he is “generally in the same neighborhood with the financial opportunities,” according to Stephen Espinoza, president of Showtime Sports. Wilder pointed out after Tuesday’s press conference that he has decided to trust the people, most notably Haymon and Espinoza, that helped Floyd Mayweather earn more than $700 million during his illustrious career, largely through major pay-per-view events. Arum didn’t compare Wilder’s earning potential to what Mayweather made, yet Mayweather’s former promoter completely understands why Wilder listened to Haymon, Finkel and Espinoza about patiently maximizing his earning potential. Finkel explained Tuesday that they’re certain a Wilder-Joshua fight will become worth more than the $40 million Skipper offered for that fight to be streamed by DAZN. Finkel reminded reporters that less than a year ago, Hearn offered a $15 million flat fee for Wilder to fight Joshua. Now Wilder has been offered almost three times that amount, a clear indication to Finkel that Wilder will be able to make much more than $40 million if Wilder and Joshua keep winning and eventually meet in the ring. Arum assumes most boxing fans and media anticipate Wilder’s decision to eventually drive up his asking price to box Joshua. Not so, Arum maintains, because he is convinced Wilder will box Fury again before facing Joshua. Arum, who tried recently to sign Wilder to a long-term contract, obviously wants that to happen because his company, Top Rank Inc., recently entered a co-promotional agreement with British promoter Frank Warren to represent Fury (27-0-1, 19 KOs). The lineal heavyweight champion will make his debut on ESPN+, DAZN’s streaming competitor, sometime in June, against an opponent to be announced soon. Fury walked away last month from a contract for a lucrative, immediate rematch with Wilder to join Arum and Top Rank. Arum understandably is hopeful Wilder will decide to fight Fury again, rather than pursuing England’s Joshua (22-0, 21 KOs). “He does have reasoning for that decision,” Arum said, referring to Haymon. “For example, [Wilder] is gonna get fairly decent money to fight this fight with Breazeale. And then, probably decent money to do another fight, and then Joshua and Fury would have a second fight [separately]. Then, next year, when Fury and Wilder fight, the amounts that were offered are miniscule compared to the kind of revenues that will come from a Wilder-Fury fight. That’s the theory. With Fury being built up on ESPN, and Wilder hopefully being built up by PBC – but particularly Fury being built up with the American audience, so they’ll know what a character he is and so forth – we would look to do at least two million homes when they fought each other. Arum’s ambitious pay-per-view prognostication aside, he is confident ESPN’s expansive reach would help him and everyone else involved produce more than the reported 325,000 buys the first Wilder-Fury fight generated. The potential windfall for Wilder, Fury and everyone that works with them leads Arum to believe he and Haymon will work together to make a deal for a Wilder-Fury rematch, just like they did four years ago. That's if wilder stays winning shelly maybe you will offer more than 120million in 4 fights. So far you told wilder to turn down 15mill to fight AJ and fight fury for 3 LOL.